We can literally cater for anything!! Since opening the cafe we have done everything from simple lunch buffets to private dinners with a cocktail masterclass to event catering in our event gazebo to banqueting dinners for hundreds and everything in between. We can open the cafe for private evening events, or even bring ourselves to you at any location. We have gone as far afield as the Peak District to do a cocktail masterclass and dinner, so we mean it – literally any location and we can be there. No matter what your event we will work with you to create the perfect menu to suit your tastes and budget. 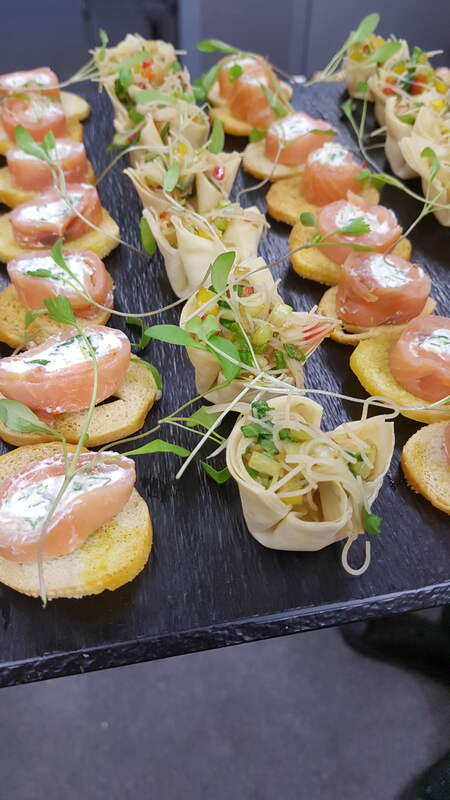 Whether it be a £5 per head lunch buffet or a £25 per head dinner menu we give you the same time and consideration to make sure your catering is exactly as you would like it. We genuinely try and do as much as we can for as little as we can. Because we don’t like to work from set templates we don’t have any outside catering menus on the website. We prefer to ask our customers what they would like and cater the menus specifically to them so if you have any enquiry no matter how small just drop us an email and we will get back to you as soon as possible. Our street food style catering gazebo (aka ‘Gluttony Grill’)is perfect for outdoor events or wedding buffets with a difference. We can serve many different types of food from the gazebo so if you need something a little out of the ordinary give us a shout we will be happy to discuss your event in more detail. Remember – with the gazebo we can literally pitch up anywhere and start serving! Copyright © 2017 Create Cafe Wakefield. All Rights Reserved.